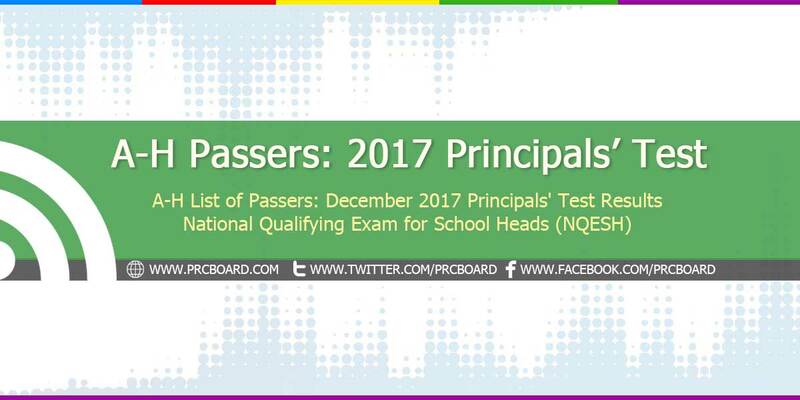 MANILA, Philippines - The official results, list of passers, top examinees and related important announcements for Principals' Test 2017 formerly known as National Qualifying Exams for School Heads (NQESH) conducted December 2017 are released by the Department of Education (DepEd) and National Educators Academy of the Philippines (NEAP) on May 29, 2018. Below is the list of passers for 2017 Principals' Test with surnames starting with letter A to H.
Principals' Test is an annual exam conducted by DepEd through NEAP for aspiring Principals. For 2017, the exams are held December 17, 2017 while the schedule of Principal exams for the year 2018 is yet to be announced by DepEd. NQESH 2017 exams are administered by the Department of Education through NEAP, Bureau of Human Resource and Organization Development and all Quality Assurance Division of each Regional Office Quality Assurance Division at designated Regional testing centers nationwide. To receive updates on any announcements about 2017 Principals Test results, we advise our readers to bookmark this page, visit DepEd official website or follow us at our social media pages via Facebook and Twitter. we're excited... palapit na ng palapit ang takdang panahon...sana isa na kami sa mga pinagpala. !thank u po. Please release the nquesh result 2017 as soon as possible.